Two years ago Christina and her mother relocated to Charlotte and she joined the unique CAET program. Christina’s goals were to become involved in her community, increase her job skills and meet new people. She worked one-on-one with her Community Coach to search for opportunities. Soon she began volunteering at a nursing home, participated in a bowling league, and attended compensatory education classes. After graduating from CAET, she became a participant in the Supported Employment program. She began working with her Senior Employment Specialist to find a job. 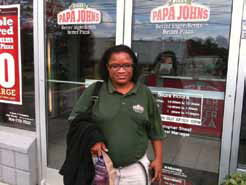 Christina obtained a job with Papa Johns doing light duties and gained a reputation as the “Pizza Box Folder”. Chris Shoaf, general manager at Papa Johns, boasts that she has the “world record” in his store for folding the most pizza boxes in one shift! Christina states that she enjoys working at Papa Johns because she likes having her own money and her manager and co-workers are all very nice. Her next goal is to advance her employment opportunities and wants to work in a hospital as a laundry attendant. She continues to work with her case manager, and LIFESPAN’s Supported Employment team to discuss options. LIFESPAN illuminated Christina’s abilities and she explains that she is happy to have received support through LIFESPAN and will most remember the fun she had and the new people she’s met.